Everyone understands the value of lakefront property. But a nearly four-acre tract of Lake Erie shoreline between a recreational park and a municipal beach in Port Clinton was a treasure that presented a rare opportunity to preserve coastal wetlands and beaches, and the associated near-shore habitat along the Lake Erie coast of Ohio. In Septermber, 2009, The Trust for Public Land secured an option to purchase this property for the citizens and visitors of Port Clinton. With the purchase, the public now has a mile of contiguous access to Lake Erie. TPL, in partnership with U.S. Representative Marcy Kaptur and Ohio's congressional delegation, and the City of Port Clinton, worked to secure federal and state grants necessary to fund the acquisition and then turn the land over to Port Clinton. 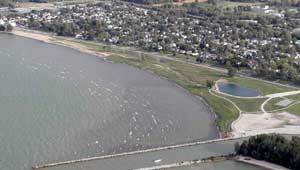 The effort to create the Port Clinton Lakeshore Preserve is part of TPL's Lake Erie Shoreline Program, an initiative responsible so far for the conservation of 1,300 acres along East Sandusky Bay.